Last night, on behalf of the College, I hosted a wonderful holiday celebration dinner. The work of our culinary students absolutely shined and all enjoyed a great, festive evening. Attending were members of the College Board of Trustees, the FVTC Foundation Board, staff, long time donors, community partners and families that created new endowment funds with the Foundation in 2011. I was really impressed with an initiative I recently heard about. It’s happening in our College’s Electrician Apprenticeship program, led by instructor, Matt Bishop. This instructor felt that this apprenticeship program could do something more to give back to the community during the holiday season. So he encouraged (sort of challenged) each of his five classes to choose their own paths with this, but to select a charity and make a difference as a class. 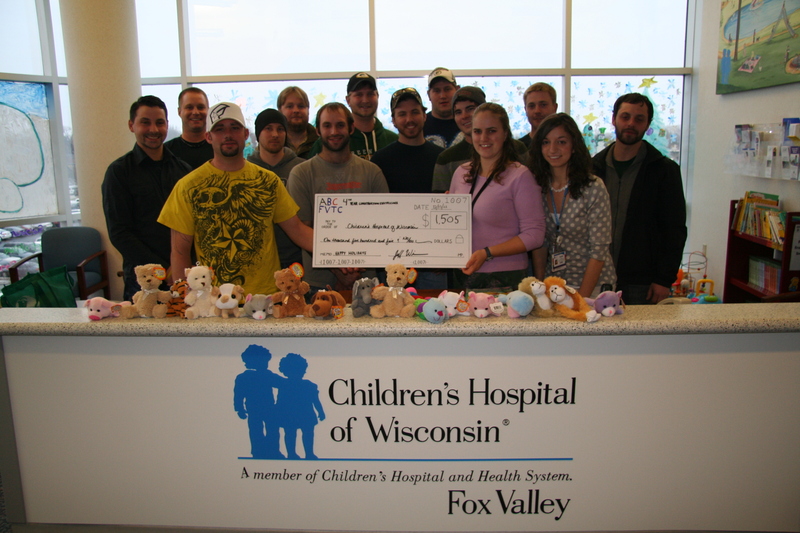 ABC Construction Electrician apprentices at FVTC provide financial and in-kind support on behalf of their employers to Children’s Hospital of Wisconsin, Fox Valley. Matt was thrilled to see his students respond and take him up on this challenge. So far, his classes have made decisions to support Children’s Hospital of Wisconsin, the Wounded Warrior Project, and the Fox Valley Humane Society. Many of the apprentices have requested additional help from their employers, and have found excellent support there as well. Wow, this is contagious. As we’ve been working with our Board to consider the possibility of a major capital referendum to support building expansions at the College, I couldn’t help but think back to the one other time in our history that we have asked our community for such an investment via public referendum. That year of consideration was 1997 and we went to referendum in April of 1998. It’s always easier to look at things in hind sight rather than to imagine what will be or the needs we need to be prepared to address over the course of the next decade or so. My thoughts went to…“where would Fox Valley Technical College be today had we not had the community support we sought via referendum in 1998?” Then, I think about the incredible surge of enrollment we’ve experienced over the last 3-4 years and would we have been positioned to serve all those individuals without the facilities we have today. The answer is simple…no. The referendum funding of 1997 allowed us to create almost all of the JJ Keller Transportation Center that exists today, completely update the Agriculture Center, build most of what we see today in the Graphic Arts and Printing Technologies Center, completely retrofit and provide the space now dedicated to manufacturing-related programming and apprenticeship training, create the Criminal Justice facility, establish manufacturing and construction space at the SJ Spanbauer Center in Oshkosh, and completely refurbish the Oshkosh Riverside Campus. I’ve probably even missed a few things here. All of these areas have flourished in support of community needs ever since—through the individual people served as well as through tremendous industry partnerships.